This is Rae’s Postcard Cuties for Winter quilt and it is a Bunny Hill Designs. This is a small wall hanging, only 36” x38” and is full of cute little appliqued wool snowmen. Rae hand appliqued the whole quilt with a button hole stitch including the scalloped edges in the border! I knew right away I was going to put a feather motif in the blue scalloped border design and straight lines in the outer border for a nice contrast. All the blocks are stitched in the ditch as well as around all the applique. To keep this quilt whimsical and folksy I did different background fills in the snowmen blocks. The details are hard to see in the outdoor shots so I took a lot of close up pictures inside. This is Kerri’s Midnight Sun wall hanging. 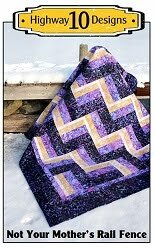 She saw my friend Barb’s quilt that I posted in April here and made a smaller version in similar colours. Since this design is very striking it only needs a simple quilting and we decided on Plush. I used Quilters Dream Blend batting and medium blue So Fine thread. We are in a bit of a deep freeze at the moment, woke up to –30’c with a –36’ windchill this morning and it’s only November! So instead of whining about it my husband and I are having fun making Ice Balls to decorate the yard. I saw this idea on Pinterest and wanted to give it a try. For our first attempt we put way too much food colouring into the balloons before we filled them with water. We ended up with nice bright coloured ice balls but when you touch them your hands get covered in food colouring and you know how hard that is to wash off! You many notice that this red one has ears…we had a few mouse shaped balloon so they ended up looking like little cats! So for our second attempt we used regular balloons and only filled them with about 2 to 3 cups of water and added 3 or 4 drops of food colouring. We just set then in the snow overnight and by the next morning they were frozen solid. We tore off the balloons and had really pretty coloured ice. I have then along our deck railing right now and hope to make a few more to display down by the dock. This is Kerri’s Deco The Halls quilt and the pattern is from Sew Kind of Wonderful using the Quick Curve Ruler. Kerri made her quilt with solid fabrics that were just asking to be custom quilted. I started with stitch in the ditch and then feathered in the red design, added swirls in the white background and then did a petal feather motif in the center. The batting is Dream Blend and I used three colour of So Fine thread to match the fabrics. When I first looked at Kerri’s quilt I didn’t notice there was a piecing mistake until I took a picture. I like to take a picture of a quilt top when it comes to me for this reason as well as for drawing on if I’m going to custom quilt it. I contacted her and asked if I could fix it and she was very happy I caught that mistake. So it is a good idea to always take a picture of your quilt top before sending it off to be quilted or before quilting it yourself as that seems to be the best way to catch any piecing errors. 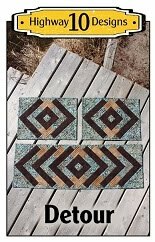 This is Trina’s version of our Highway 10 Designs Alternate Routes quilt pattern. She used one of the 20 layouts in our pattern and I had not seen this layout done yet. This quilt is for her husband, who did a great job picking fabric, and it will be going all the way to Peru where he is working now! We discussed pantograph designs and decided on Ebb and Flow to keep with a more modern feel. Used Quilters Dream Blend batting and charcoal gray So Fine thread. 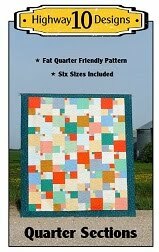 I finished my Lug Nuts quilt this week, just in time to share for Sew Sisters Blogathon Canada! If you are new to my blog and visiting from Lori’s Night Owl and Dyeworks, I welcome you to northern Manitoba! 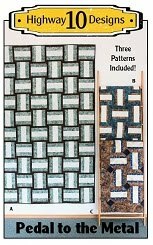 I am a longarm quilting that also designs quilt patterns with my good friend Lori, we call our design company Highway 10 Designs. We have an Etsy shop and are also very excited to have Sew Sisters carry our patterns in their shop! Hope you have time to check out my blog and all the tutorials on my sidebar. I love quilting with batik fabrics and also dyeing fabric, especially snow dyeing since we have snow 6 months of the year. I started this quilt back in August when I taught a Lug Nuts class at our local guild. I loved seeing all the different fabrics the guild members were using for their quilts and I know a few might be coming my way to quilt so I’m excited about that. I used all batik fabrics, Quilters Dream Blend batting and blue So Fine thread. The pantograph design is called Allium and added a soft curvy texture to the angular piecing. Just like we showed in the pattern I pieced the backing with the extra triangle pieces. I usually don’t like to piece my backing but Lori was right, it does look great and was worth the extra effort! The lake ice is now about 8” think as it as been very cold here for this time of year so it is building up quickly. It makes a great backdrop for quilt pictures…when the wind isn’t blowing! You can see some of the paths and rinks I have been clearing for my photographs. I’m so happy the ice is so clear and smooth near the shore this year and hope it stays that way all winter. Thanks for visiting and I hope you enjoy the rest of Blogathon Canada! 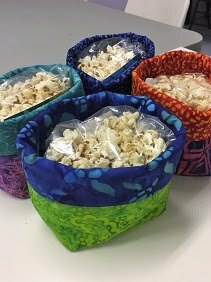 Sew Sisters Quilt Shops has once again organized Blogathon Canada for our enjoyment! It starts today and I hope you will jump on over to their site to see the schedule of this weeks guest bloggers. Each day two bloggers will be sharing a list of great blogs in each of their provinces and have a special giveaway. I was very fortunate to host Manitoba last year and very happy to say that my good friend Lori at Night Owl Quilting and Dyeworks is the host for Manitoba this year. Her day is on Thursday and I plan on doing a special post to participate too! Now get on over the Sew Sisters blog and check out all the great blogs being shared today. Now to what I have been working on. I just finished quilting Bonnies Modern quilt that she designed for her daughter, no pattern. She wanted simple, clean line quilting to keep with the Modern feel and with this being a large queens size quilt I kept the quilting designs light. The back was pieced as well so I could be a reversible quilt as well. I was hoping to get some pictures of this quilt out on the ice but it has been so windy it was a losing battle to try to keep it flat. Hope this wind dies down soon as the windchill has been –25’c!! This is Phyl`s Hot Flashes quilt and I thought it was fitting that it be the first quilt I photograph on the ice this year. Who doesn't need to be cooled down when having a hot flash! 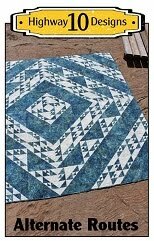 The pattern is by Daniela Stout of Cozy Quilt Designs and the fabric is a Bali Pop called Volcano. I used Plush for the quilting designs, Copper coloured So Fine thread and Quilters Dream Blend batting. Before you give me heck for walking on the ice it is 4 inches thick by the dock so that is safe to support my weight. I was so happy to see that is froze so smooth and clear right beside the dock, I wasn’t expecting that. You can see how clear it is in the next photo, you can see a boulder under the ice! We also woke up to a beautiful scattering of hoar frost crystals again this morning, this happened last year and you can see those pictures here. This time the frost nucleated in the wet patches on the lake as well as long the edge of the snow where I had shovelled the rink. Looks like a white feather boa! Here is a single crystal with a quarter for scale, most of the larger frost crystals are one to two inches in size.